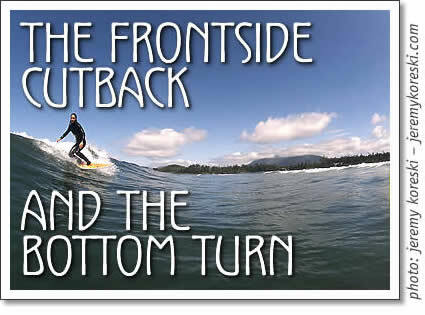 The frontside cutback is a move that is used by surfers of all skill levels. The cutback allows you to use the rail of your board, and brings you back to the source of the wave where you can generate more speed for your next hit. Like every other move in surfing the frontside cutback starts with speed. By entering the turn with speed you will be able to lean on your rail harder adding more spray, and style to the turn. Pump down the line looking for a section that has a nicely sloping shoulder to turn on. Start your bottom turn as soon as you reach the flats, and drive up the wave face at a 40 to 60 degree angle. When you reach the middle of the wave face bend your knees and shift your weight from your toe side rail to your heel side rail to initiate the cutback. Twist your upper body in the direction you are turning, and extend your leading arm towards the water to keep a low centre of gravity. Most of your pressure should be applied to your back foot while your front foot guides your board through the turn. Halfway through the turn your leading arm should be touching the wave face. This keeps you low to your board as well as providing a point for you to pivot around. Lean on your rail as hard as you can during this part of the turn to create a tight powerful arc. Be sure to watch the tip of your board as you turn because you want it to fit into the transition of the wave perfectly in order to maximize speed. As your board turns back towards the white wash you want to finish the turn. Do this by straightening out you back leg, and centering your weight over your fully bent front leg. This will add snap and style to the turn and also keep you low to your board. Your board will finish with the nose pointing straight back towards the white water. Stay low and focused on the front rail of your board, and how it fits into the transition of the wave. Now that the turn is finished turn your board back towards the open face of the wave by pressing on your back foot. Watch the transition of the wave as you pivot so you don't nosedive, and go straight into your next bottom turn. The only way to learn cutbacks is to go surfing so get off your computer and get out there. Check out Sepp Bruhwiler, Kelly Slater, Andy Irons and most importantly Taylor Knox because he has the best cutback in the business. The bottom turn is the most important move in surfing. It is used every time you catch a wave, and every time you do a maneuver. Having a solid bottom turn is essential to improving other areas of your surfing. The first thing you need to do is catch a frontside wave, stand up, and ride down the wave face with all the speed that you can. Ride to the bottom of the wave until you reach the flats, the area in front of the wave with no transition. Right when you reach the flats start your bottom turn so you don't loose any speed. Bend your knees slightly, and lean on to your toe side edge to initiate the bottom turn. Be careful not to lean too far because you will bury your feet under water, loose all your speed, and fall off your board. Your weight should be evenly distributed between your front foot and your back foot, and you should be focused on the part of the wave where you want your bottom turn to end. Hold your line, keep your knees bent, and when you come off the flats on to the transition shift most of your weight to your back leg. Push on your back foot in order to gain as much speed as possible while driving up the wave. To finish off a good turn hit the lip hard, or do a powerful cutback. Once you've completed a maneuver at the top of the wave continue down the line and start your next bottom turn. After some practice your bottom turns will be wired, and you can start leaning into them by putting your trailing hand in the water. As you can see there isn't that much to a good bottom turn, but attention to detail will give you a little bit of extra speed. This will allow you to make all your maneuvers faster and more radical.